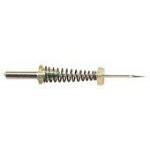 This Embroidery Needle includes a spring around the needle which assumes the function of the presser foot. Allows better sight when used for for free-motion quilting or embroidery. The sewing machine presser foot must be removed. Size 14/90. 1 needle per pack. Carded.